In the past few years influencer marketing has become a regular strategy piece in a brand’s marketing repertoire, but that doesn’t mean that it’s not evolving, and growing. A few years ago the reasons to believe in the power of influencer marketing were simple: Boost brand awareness, and find new brand ambassadors to use in your advertising campaigns. There just wasn’t much of a distinction between influencers and celebrities. Now, with the advancement of social listening, and marketing-friendly social network features, we can see that influencer marketing is making an impact in several new ways. In this article, we’re going to discuss some of the biggest reasons to believe in the power of influencer marketing. We’ll also explain a little bit about how influencer marketing is changing to better reach target ROI goals. Traditionally brands will use an internal team to create assets for a campaign, and maybe use a celebrity to boost the visibility of the campaign, but there was always something missing from this tactic. People started to distrust the messaging; They recognized an ad and stopped listening to its message. Consumers were fed up with impersonal advertising. Bloggers and social media power users build an audience by publishing authentic, thought-provoking, and visually appealing content. Their audience, made up of everyday consumers, enjoy consuming this content because they can replicate the ideas in their own lives. Most influencers are not celebrities who can attract global attention, but they do specialize in topics, which attract a likeminded, targeted audience. There is a level of trust between the influencer, and the consumer, that rarely exists between a brand and its shopper. Unlike ads, which are paid for by big (and often impersonal) businesses, sponsored influencer content is published by someone who is relatable – a real person. Social media is a great way to get exposure for your brand and your products but turning an impression into a sale is one of the toughest problems facing digital marketers today. Some micro influencers might not have the audience size of big well-known brands, but they are yielding better results in terms of ROI. Evergreen content is defined by its long-lasting value to readers. The content remains highly relevant over a long period of time and ticks all the SEO boxes. Content created by influencers has a good chance of becoming evergreen because it’s authentic and relevant to their followers. Using live video features on Snapchat, Facebook, Instagram or Twitter, influencers have freedom to express themselves. They can also connect more closely with their audience by answering questions and engaging with their comments. Influencers are able to promote a brand’s message while maintaining an unscripted and authentic feel. The video above from Spaceships and Laser Beams is a great example of how well live Facebook videos perform as part of influencer campaigns. Best of all videos are boasting higher engagement rates than standard content. Thanks to social listening, and big data tracking, we are able to measure the value brands get from influencer campaigns. 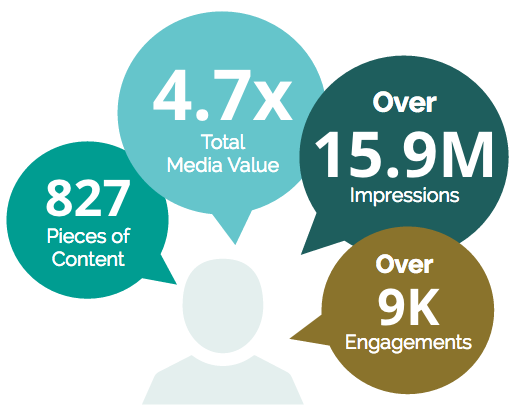 Using metrics including impressions, engagements, and total media value, influencer marketing generates 11x greater ROI than traditional advertising efforts. In 2017 influencer marketing is also diving deeper into metrics that your brand needs more than ever – demographics and purchase intent. This data analyzes potential influencers’ target market vs. the perfect audience to share the message with. It also explores tangible results and identifies nuances within the audience segment.